From a design standpoint, the American license plate is a mess — some states' efforts are simple and appealing, but others are visual disasters. Ken Carbone of Fast Company commissioned a few designs he thinks'll clean things up. —Ed. "Back to the future" best describes the new license plate issued by New York in April. The "Empire Gold" design now appearing on streets has been deemed "quite unappealing" by more than 80 percent of New Yorkers polled by WCBS-TV. New Yorkers: Consider yourselves lucky. Connecticut: This plate is so harmless it says nothing in the right way. Florida: This is a "more is more" design where everything is as important as it can be. Utah: With two state mottos, snowy peaks, a skier, and Native American petroglyphs, the only things missing are images of the Utah Jazz, the Sundance Film Festival, and the Great Salt Lake. In many states, license plates can be a form of personal branding. The state of Washington offers no less than 45 designs from which to choose. If you want fellow motorists to know you're a Mason, a firefighter, or a square dancer, there's a plate for you. Custom plates are revenue generators for budget strapped states, so I applaud the strategy — but the designs could be better. When it comes to the standard issue, I asked a few talented designers from around the country to reimagine their state license plates and to experiment with the possibilities for three designs: Texas, Illinois, and California. And here they are. Craig Minor in Houston took the big, bad, "Don't Mess with Texas" approach but with a bilingual accent. It's a roughneck solution that makes the state's current plate look terribly silly. Bart Crosby from Chicago strikes a contemporary note with speed and style. Left to right across the top of the plate are color coded city, state, and emission stickers that are read with a hand held scanner. The result is a "Formula 1" alternative to the muddled "Land of Lincoln" clunker. 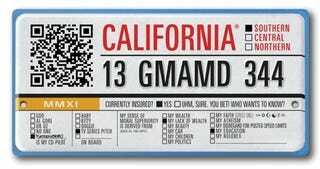 Stefan Bucher from Los Angeles offers a 10-digit design that expands the pool of available license plates. He loads it with personal information about the driver that is ideal for our networking culture. The frame is color-coded to distinguish political leaning. A regional mark allows for "faster stereotyping," and he adds a QR code for a touch of edgy technology. As for New York, I can imagine a stripped-down design with minimal graphics exposing the raw plate. Numbers are punched through a recycled alloy imbedded with registration information. This will complement the metallic trim on all automobile makes and models. Current license plate design is a sadly low-tech solution for our high-tech cars, and not even a Tesla escapes having one slapped on to the bumper. Although not the highest priority for the advancement of car culture, I think some creative and innovative opportunities are just around the bend. Ken Carbone is a graphic designer whose clients have included Tiffany & Co., W.L Gore, Herman Miller, PBS, Christie's, Nonesuch Records, the W Hotel Group, and The Taubman Company. Fast Company is a magazine/website charting the evolution of business through a unique focus on creative individuals who spark change in the marketplace. This story originally appeared on FC.com on June 3, 2010.